It’s time for another Miscellaneous Ask DST, in which Diamond Select Toys president DSTChuck answers your questions about a variety of topics! Potential expansions to our Universal Monsters, Mass Effect, and electronic vehicle lines are all discussed. Read on, then submit your own question via the drop-down menu above! Hello, I have been collecting your Universal Monsters Banks. Do you plan to make Dracula and the Phantom of the Opera in the future? Thank You. DSTChuck: Honestly, I do not know – we have not decided yet if we are going to make any new bank designs. I am loving your Universal Monsters select figures, and I have a burning question that has lingered within my dark monster-loving soul since the first set’s Frankenstein [the Creature] came with the lab table- do we have any chance of perhaps getting a figure of Colin Clive as Dr. Henry Frankenstein? DSTChuck: Ronnie, glad you dig the line, but no plans right now. I think we have pretty much locked down the three we will be doing for 2015, and hope to show them at Toy Fair in Feb.
DSTChuck: All of those have been considered, but none are in the works right now. The Michael Knight kind of worked out, so if that happens again I see no reason why we would not do that again if it works out. 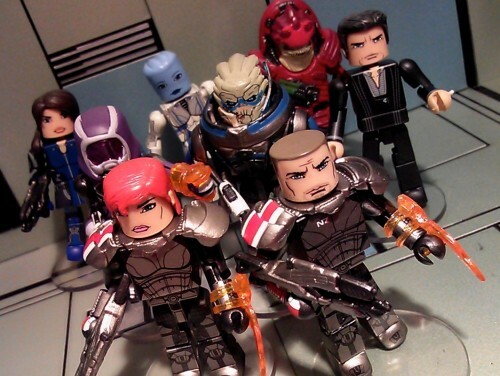 Hi, I was wondering if the mass effect minimates sold well, would you consider making action figures? DSTChuck: I think we all expect the Mass Effect line to do very well, and yes, we’d love to continue and expand the line. I was wondering if you guys have rights to ‘The Mummy’, and if so would you guys ever make an Anaksunamun? That would be AWESOME!!!!!! DSTChuck: Sorry, we have no rights to the newer Universal Monsters movies. Hi, I really like your 1:15 Back to the Future time machine. I read somewhere that Diamond Select will be making a 1:15 Ghostbuster Ecto I too, which I am also looking forward to. Any chance of making a 1:15 Batmobile from 1989 Batman or maybe 1:15 Tumbler from Batman Begins? Thanks. DSTChuck: Right now, we have no rights to any Batman vehicles, but for SURE that is something we’d love to do in the future if we could. Ask DST #221 – Monsters and Miscellany!